Tottenham Hotspur have reportedly named their asking price for England captain Harry Kane amid interest from European champions Real Madrid. Real started Sunday fifth in the La Liga table having scored 24 goals fewer than rivals Barcelona this season. Their relatively poor scoring record this term can largely be put down to the summer departure of Cristiano Ronaldo, who has yet to be replaced. Ronaldo scored in excess of 40 goals in eight straight seasons before leaving the Bernabeu to join Juventus in July. In his absence only Karim Benzema (12) and Gareth Bale (10) have reached double figures in all competitions at the midway point this season. 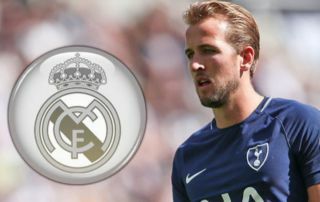 According to The Sun, Real’s search for goals has seen them identify 25-year-old Kane as their top transfer target. Kane, who won the Golden Boot at the 2018 World Cup in Russia won’t come cheap though. In fact, The Sun claim that Spurs have placed a £310million price tag on their star striker’s head. Neymar is currently the world’s most expensive football having joined PSG from Barcelona in 2017 for a record fee of £198m, as reported by The Telegraph. Were Kane to leave Spurs for £310m, he would break Neymar’s world record by a whopping 56.56 per cent.